Entertaining family and friends can be a lot of work, but we’re here to lend a hand and lighten the load with our Danby Entertaining appliances. Never worry about running out of ice with the Danby portable ice maker! They have the ability to make as much as 25lbs of ice in a single day, saving you countless trips to the corner store. 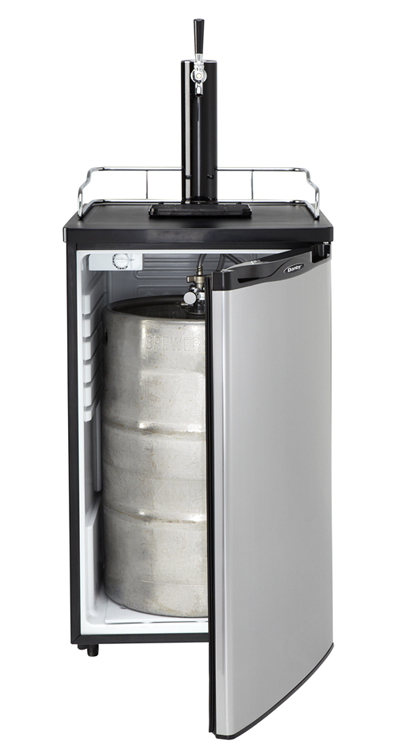 If you are a beer drinker, the Kegerator is the perfect addition to your game room or man cave. Serve your guests a perfectly chilled pint and you can forget about cleaning up the bottles and cans, just toss the glasses into a Danby dishwasher to make cleaning a breeze! Are you looking to keep your wine chilled to the perfect temperature? Danby wine coolers make a great addition to your kitchen or you can make your own wine cellar. Choose from a variety of designs to suit your style. Danby’s beverage centers allow you to keep your beverages out of your refrigerator. These stylish centres make for a great addition to your home. Keep your beverages chilled and ready to be served. We know the home is meant for entertaining, we have to appliances to do it right! Beverage centers are the perfect bar fridge, offering an alternative to storing soda and beer in your main refrigerator. With capacities ranging from 80 to 120 can you will never be short on cold beverages. Our compact portable ice maker is just what you need for fabulous entertaining! Every beer lover's dream is to be able to pour an ice cold draft beer in the comfort of their home. Danby makes that dream a reality.